This bundle allows customers of GoodNotes 4 to download GoodNotes 5 for free or at a discounted price. GoodNotes 5 is available as a free upgrade for existing customers who paid the full price for GoodNotes 4. If you previously bought GoodNotes 4, you can buy this bundle using "Complete My Bundle" to get the price you paid for GoodNotes 4 as a credit to the bundle price. If you downloaded GoodNotes 4 for less than the full price, you can use "Complete My Bundle" and only pay the price difference to get GoodNotes 5. GoodNotes 5 requires iOS 12 to run on your iOS devices. I concur this update has taken a few steps backwards, despite small improvements. - Can no longer highlight with the shape tool! For these reasons, I will be sticking with GoodNotes4. GoodNotes is amazing and I’m sure they’ll work out the nuances. I’d love to see multi-note (pulling up two or multiple notebooks on the same screen) capabilities, voice-recording and real-time playback, and ability to recognize more than one language simultaneously (handwriting recognition). If these features were added and/or fixed, I’d jump over to GoodNotes5 in a heartbeat. However, it’s simply too early to make the move. Looking forward to the updates! Thank you for gifting GoodNote4 users with free GoodNotes5 application. I know you didn’t have to do it, but thanks for the free upgrade from v4 to v5. Its especially appreciated since I just bought GoodNotes 4 2 months ago. Like some other recent reviews, I too feel like this is a downgrade. GoodNotes fits in my workflow as a convenient app for marking up PDFs and making the notes very presentable. I import a PDF and use the highlighter tool (with shape tool for clean lines) and add pen or text box notes. Then I save the marked up PDF into Dropbox and access it from other devices. In GoodNotes 5, the shape tool has shifted from a way to create clean lines to a literal “draw a shape” tool which does not aid in making clean markups. Exchanging files via Dropbox has become a hassle when you have to send a notification email every time you try to sync. There are issues with inconsistent pen widths as well as inconsistent text formatting. 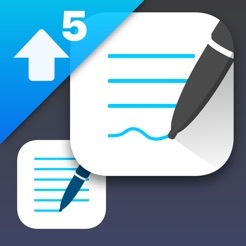 Overall, GoodNotes 5 has slowed my workflow and feels like a step backwards. I like the shortcuts for 3 colors and pen widths (if only widths were accurate), but overall it’s too much of a step back (especially Dropbox syncing), so I’m sticking with GoodNotes 4 for now. Hopefully the developer listens to feedback and can restore the productivity of this app.